We eat when we’re hungry of course, but we also eat when we’re not. We eat when we’re bored, stressed, sad, excited, anxious. We eat at celebrations. We eat at events. We eat alone and we eat in crowds. Food is often the center of everything we do. It’s good though, because we have to eat to live. We have to eat to thrive, and we have to eat to fuel our bodies so we can do what we love. But sometimes we don’t eat when we’re hungry and don’t stop when we’re full . In fact, did you know the actual definition of emotional eating is any type of eating that is not driven by biological hunger? You mean to say emotional eating is not sitting on the couch with a pint of ice cream and a good chick flick? Precisely. Emotional eating comes in all forms. It affects all people in some way or another. And, it’s not always a bad thing. Sometimes going out for drinks or dessert with friends is healthy for your mental and emotional health, even if you’re not hungry. Sometimes a bowl of ice cream for dessert is just fine. Where can you find a balance between living a full, rich life in control of your food choices, and living a life of fear around food, your relationship to it, and an overwhelming lack of control when surrounded by it? Today is all about taking the simple steps to healing your relationship with food. To feeling comfortable around it, to feeling in control over it, and to feeling like you can enjoy any event or experience where food is present. Before putting anything in your mouth no matter what the situation, just stop. Stop for a moment. Stop to get in tune with your body and stop to get in tune with your mind. What is your body telling you in this precise moment? In fact, ask yourself the simple question, “where am I at right now?” That’s all you need to do. Take a minute, stop, and evaluate where you are. Next, it’s time to recognize what’s going on in that moment. Once you’ve stopped, you’re now evaluating where you are. Are you truly hungry? Are you stressed? Bored? Frustrated? Take a minute to recognize what your body is telling you. If you are biologically hungry, then eat. Otherwise, recognize the emotions happening inside of you. Can you pinpoint one particular emotion that’s strongest? The key is to recognize what your body is telling you. That’s all you need to do. Listen to your body for a moment. Figure out the message it’s trying to send. Once you’ve figured out the message, you have one of two options. You can distract from the emotion by getting away and doing something that takes your mind off it for a while, or you can deal with the emotion. Take a minute to decide what distraction might be healthy for you. Are you stressed or burned out from the day? Try a simple walk around the block to see if it clears your mind or gives you a little burst of energy. 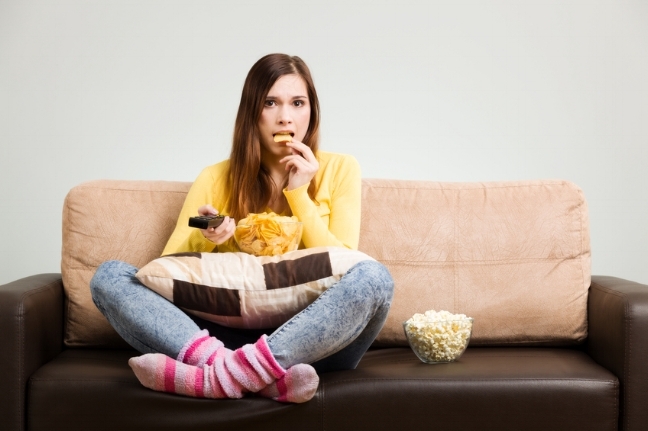 Are you eating because you’re bored? Try grabbing the nearest book to read, clean something, or pick up a hobby. Distraction can help get your mind off the food and onto something that will help the emotion. If you choose to deal with the emotion, find a way to eliminate it as much as possible. Are you angry at someone? Give them a call and work things out? Are you overly stressed about a project at work? Spend 30 minutes on it and then be willing to walk away after that knowing you did your best. Either way you choose to deal with your emotions can be beneficial. Sometimes it’s a lot to deal with them, so we just need a distraction for a bit. That’s ok.
Just remember to stay away from the food during this time so as not to create more temptation. Now that you’ve stopped, recognized, and dealt or distracted, what can you learn from this experience? Was there a particular method that worked well for you? Did you still crave the food? Did the emotions disappear? Did you ignore the emotions and eat anyway? Ask yourself questions surrounding the event. What did you need at that precise moment and how did you handle it? If you want, use a food journal or an emotions journal to help you document the scenario and subsequent scenarios surrounding your relationship with food. Learn from the process. Sometimes failures are our best learning experiences. Learn from what went wrong, and keep doing the things that were a success. Lastly, repeat. Repeat these 5 steps every time you are driven to emotional eating. Or every time you are driven to eat when you’re not biologically hungry. Repetition and practice are the keys that will help you overcome any issues you have with food, the availability of food, forbidden foods you’re nervous to be around for fear of overeating, or wanting to enjoy the party without obsessing over the food. Anytime you struggle with your relationship with food, follow these 5 steps to help you work through any emotion or situation you are experiencing. A life of finding peace with food is possible. Try these 5 steps today. And, if you need more help gaining control over emotional eating, take my free mini Make Peace with Food training. This training is a series of 3 videos to help you recognize and understand your eating patterns and use the right keys to start improving your relationship with food.